Race report from the Northern Cross Country Championships at Pontefract at the weekend courtesy of Phil Robertson. The day started with the debate of what time do you set off for a Northern Championship race at Pontefract. Some of the elderly fraternity decided upon leaving at 9am to leave time for coffee breaks on their 90 minute journey?? I got a lift off Bill Wilson, with the company off Claire Lloyd and Phil Askew who’d all just done the Riverside Park run. Not far to walk for the shuttle-bus and then off the bus we went and we were confused with the amount of people that were leaving Ponte racecourse only to realise that they were there for the Junior runs. I got stuck with the big tent which was on wheels so I didn’t really mind (at first) then off we go onwards and upwards to find a suitable pitch. We were slip sliding away before we got anywhere near a pitch. not a good sign of things to come, I ended up having to pick up the tent and lug it over the boggy field whilst we found our bearings. The wind was blowing and it was a very icy wind and the task of setting up the tent began, all the team rallied round and before we knew it we had a base for the day. Once up everyone started to get organised and get their game face on, well apart from Phil James who had a small pep talk with me and the other Phil (Askew) #teamphil. So I thought balls with this I’m not hard enough to stand out in the cold, I’ll have me a little seat in the tent, at the same point the girls decided to get changed, not a problem I’m facing the opposite way and I’m the perfect gentlemen, a few of the guys had just returned from their a little warm up just at the point that Gemma was stipping off (coincidence?) and then Phil James wanted to see what the commotion was about so he was enjoying the view. Fred (the chairman) suggested us boys headed off for a scouting mission to view the course, good idea for the fit lads, me and Phil Askew thought balls with that I’ll view the course on the 1st lap, after all that’s why we do three, not that we like to mention it. In the end me and Phil A decided to go for a little toddle about and view the course, so we wander on round past the burger vans (aarrrgghhh!!!) and down towards the lake, this is when we start to realise how big these laps are. We try to pick out the racing line and the line that’s got the best ground “keep to right” then see a mahoosive puddle “ball’s with that keep to the left”. BANG!!! and the girls were off, “where shall we stand? Where else than right next to the big puddle to see if anyone has lost their sight and ends up face plantin!” Unfortunatley it wasn’t to be and they all just swayed round it, disheartened we headed off for a little pee then off to cheer the lady hoops round. Seen the elite girls come round looking quite comfortable and fast, about four minutes later super Gemma Bradley came round, Woah! they must be quick we said, we then waited in anticipation for the rest of the ladies team to come round. Claire Lloyd was next with a face that appeared to be showing exactly how she was feeling (oh dear this isn’t going to be good if she’s like that after 1 lap). We cheered on a few of the other clubs Jarra and Gateshead mainly and then lovely Sarah Jones was next to come up who said at the end “I’m really sorry for throwing my buff at you”, what she really said was “Please can you hold this for me Thank you”. To be fair she looked comfortable but was obviously feeling the increase in body temperature due to her efforts, then came Lois who didn’t look happy at all followed by Gillian who’s always smiling . Really proud to watch the girls go by. followed by Sarah 43:47 who managed to catch and pass Claire 44:20, then came Lois 46:06 & Gillian 49:06. 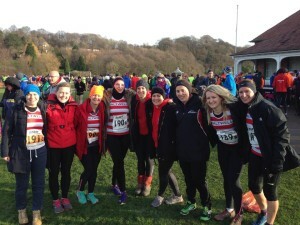 A thoroughly fantastic effort by the ladies in very challenging conditions. Back to the tent I go, off comes the base layer and the jacket and on goes the Saltwell top, take off me harrier league number that I put on last night because I thought I was being super prepared. We were then greeted by Joe who was stood in the opposite corner and said in his lovely Liverpool accent “Alright lads, I’m really sorry but I’ve gotta get changed and get the auld fella owt”, then he come and stands reet above me head, WTF?? ‘you’ve got all the tent and you place your backside above me bonce?? I move and finish off getting changed and then later realise he was a teensy bit scared in case the women came back and caught him with his pinky out, so he needed a corner to hide his modesty. Start time approaching for us blokes so a general trot up to start pen and after a few ‘good luck’ handshakes comes our new war cry of ‘HOOOOOOPPPPSSS’ we got a few funny looks and we’re almost ready to go. Then Phil James turns around and says “Hands up the puffs with gloves?” a few raised hands from our Saltwell gang and get into position. So onto the race and the gun goes again, I’m running side to side with Bill and Naz and Phil Askew breathing in me ear. I thought balls with this I’m gonna run my race, keep it steady and pick em off on the last lap (PAH!!). Got down by the lake and the massive puddle and gave it a swerve and kept to left and I thought all’s going well. I’m keeping up with my road race pace of 8:30 miles, more than happy with that and Naz and Jo are still in my sights. Round the boggy bits and a bit of respite, downhill (but what goes down must come back up!!) onwards we go on the ascent and I can see Naz, I can smell Naz, I can touch Naz, “You alreet Naz?”. Off I go in search of the next pacemaker then someone actually passes me, Derby AC where did you come from, you’ll do, if you can pass me then I’ll stick with you. I then get to that awful double back part where you get to see everyone that’s that fitter,faster, slimmer than you, head nod from Scott Garret, “go on Phyllis” from Bill, thumbs up from John (reciprocated) and a big wave from Joe (thumbs up in reply) and off we go round the corner towards the long uphill slog of the first lap. Head up towards the end of the first lap and I hear a familiar voice of Fred (who pulled out of the race before the start with a sore calf) “Go on lad keep that pace you’re doing well” (that’s exactly what I was thinking) then of to see the girls at the top, “Go on, you’re doing great” gotta love their enthusiasm. This is the time that I start to get lapped by no less than Alistair Brownley (Olympic champion, worl champion, commonwealth champion etc..) and the other front runners OMG they’re pretty fast like, it was like I was sat down watching them. So then it’s just a case of convincing yourself you’re doing well just to survive, just settle into your pace but WOW it hurts. Then it’s into sprint finish territory and I’m beat, I don’t care where I come or who beats me or anything else, I finished, I’m proud of that and not a lot else. A little sit down and reflect on the fact that these courses don’t agree with us larger folk, cracking to have a good bit banter with people you’ve never met before and may not ever meet again but we have a common goal. Thought I was in hell until I seen Naz coming in not too far behind me, valiant effort and then the wait for super Phil Askew, hats off he’s still there and he’s still competing, he will get there. Thanks to Fred who turned up even though he couldn’t run and gave a lot of support to his team mates, all the hoops stayed behind for super Phil A to come in (Eventually lol). What a team. We couldn’t believe the marshalls started taking the course down before the last runner had come in, Respect to the other clubs who gave Phil the biggest cheer of the day when he finished, he is determination personified. This Saturday sees the return of the Harrier League after a couple of months break. The event is at Bedewell Park in Jarrow with Senior ladies off at 1.10pm, followed by the Senior men at 2.15pm. The postcode for the event venue is NE32 5NJ with a map and information available on the Harrier League website http://www.harrierleague.com/fixtures.php?id=12. Parking is restricted to residential streets around the venue so we are asked to be mindful of residents and car share wherever possible. If you have done any Harrier League fixture this year (Cramlington, Aykley, Wallington), just bring along your number. If you registered at the start of the season but have yet to run, we will have your number and can bring this along on the day. If you did not register at the start of the season but are keen to run, a maximum of 4 Saltwell runners can register on the day and there will be a registration area on site. If you’re still not sure what cross country is all about – talk to your captains or coaches – we’d love as many people as possible to come down and give it a go. Jarrow is one of the closest venues so even if you just fancy coming down to watch to get a feel for what it’s all about it would be great to see a big Saltwell presence. All we ask is that you shout HOOOOOOOOOOOPS at the top of your voice!! Please find details of the 2015 NECAA Fell and NEHRA championship races and scoring details here. Contratulations to all the hardy folk who turned out yesterday for the Durham Cathedral Relays and battled round a wet and windy course. The start of a new year for runners often means choosing races as we try new things or work towards our new PBs! To help with this, we’re really keen to find ways for all club members to find race information and to communicate between eachother about who is entering what. We are therefore currently looking to develop areas of the website where information can be shared about races, and can also streamline communication about entries for team events. But while this is under development, we thought we would put together a list of events on the racing calendar which have traditionally been popular amongst Saltwell members. This is by no means an exhaustive list but is just a bit of a starting point for people to identify races to help them to work towards their goals. Hopefully there’s something for everyone and maybe some ideas for things you haven’t done before. Details still to be confirmed are the dates for the club races, alongside details of the nominated Captain’s races. Watch this space for more information! Teams need to be registered 20 minutes before the race so if people could get there about 9.30-9.40, this would be great. A map of the route and local area can be found at: http://www.durhamcityharriers.org.uk/events-fixtures/cathedral-relays/. The terrain is grassy but flat! There isn’t much information about parking on the webstie but apparently most people park in the lane next to the cricket ground with no problem. I’m sure as you get close to the race venue this will be clear and as always, car sharing is recommended. On the 1st January when most sensible people were still nursing a hangover, others were running on the Town Moor or up at Morpeth, I decided to have another crack at Fell Running. This time it was the Captain Cooks Race down in lovely Cleveland. Having dragged Lyndsey out of bed for moral support and company, we headed south expecting to be the only Saltwellians. Little did I know that Tim Foster had also had the same daft idea, with Keith Wood there in an advisory role. This basically meant standing at the top of the hill and shouting when we got near, which was very welcomed. After queuing up for the pub, sadly just to get my number, and wishing Tim all the best for the race, I lined up in the main street of the village for the mass start. Not being particular familiar with fell running I lurked in the middle of the pack waiting for the off. This was a school boy error because I soon realised, as the swarm of people bounded up the road towards the fell, that I had started too far back and could not get up to speed. It wasn’t long though before I would have given anything for speed. As the roads gave way to a farm track, then to a muddy path and then to what can only be described as a near vertical ascent up through a wood, the speedometer was tittering above zero, not helped by the copious amounts of food and alcohol consumed over the Christmas period. It quickly became a case of just get up by any means necessary. Definitely need to work on uphills. It wasn’t long though until Captain Cooks Monument loomed on the Horizon and the hard bit was done. The terrain flattened and I managed to pick up my pace once again and with the encouraging bellows of Keith “Come on Saltwell” echoing in my ears, I got the bit between my teeth and set off on the downhill section, arms and legs windmilling all over the place. I must have being doing something right as I picked up a lot of places and continued to do so on the road section which was sandwiched between the fell and the woods that made up the last bit of the course. In typical Saltwell style i.e. not really doing a reccy of the route or taking a watch to gauge the distance, I continued to push on gaining a few more places, including three places when I made an audacious passing manoeuvre coming of a style. 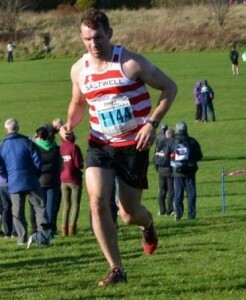 Then as I was going for another pass I rounded a corner and realised I was at the finish. Great in one sense but not in another as I still felt like I had plenty to give. Second school boy error of the day, know the course, know the distance and know my pace. After dusting myself off and handing out the obligatory handshakes, I found Lyns who had been waiting for me at the end who proceeded to give me the usual debrief….well done baby you did great but some of the people who beat you really look like they shouldn’t be able to best you. Cheers. It wasn’t long before Tim came bounding over the line to complete the Saltwell finishers, in an excellent time of 44.05 and position 114. For those that are interested I was 69th in a time of 41.12. Plenty of room for improvement but a great race and I think the fell running bug is definitely starting to bite. 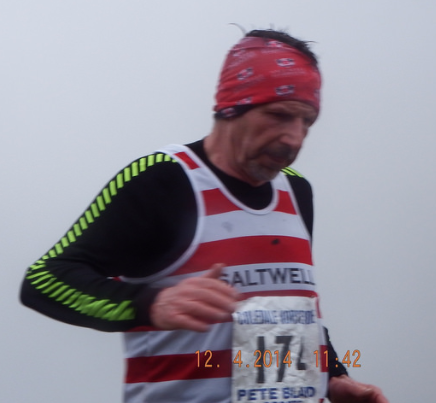 Congratulations to Fred Smith for winning the 2014 internal fell race series.